A.B.C. Hank is undoubtedly one of the great names in tattoo history. His personal history is virtually unknown. 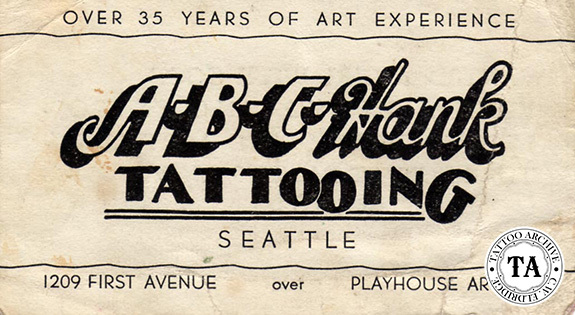 One of his 1940s business cards was acquired by the Archive, which stirred up interest in this tattooist. The card showed Hank on First Avenue in Seattle at one of the many arcades that lined this street during the 1940s. 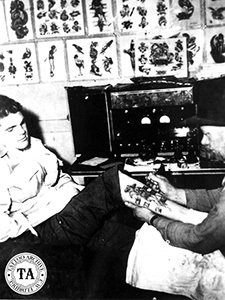 Seattle has been a popular tattoo town since the mid1800s and through the years First Avenue was the home of many a tattooist including George Kruger, Danny Danzel, Slim Lewis, E.D. Horton, Jack Ross and many others. machines in a metal looking sloping cabinet with a large dual gauge power supply above them. Four white opal color jars are visible on the work shelf. Since no connector cords or a switchboard is seen one would assume he is working with a clip cord. This fact alone may be the best way to date the photograph, which could be circa 1950s.